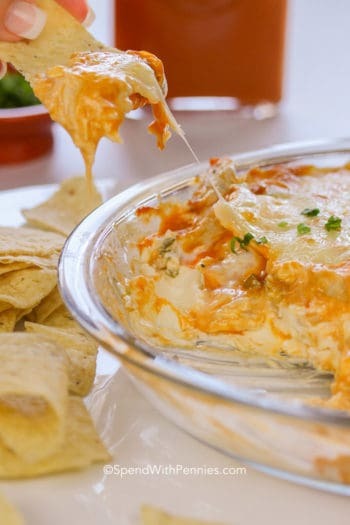 The BEST Buffalo Chicken Dip (video) – Party favorite! Everyone devours this! 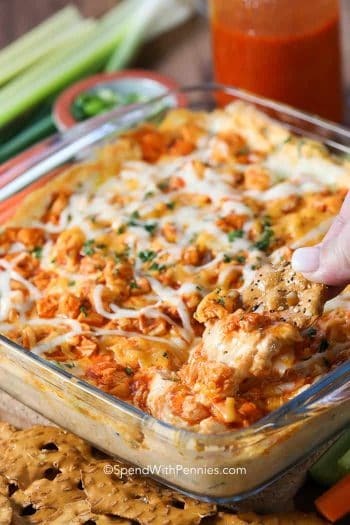 Buffalo Chicken Pasta Salad– Easy potluck favorite! Crispy Buffalo Fried Tortellini – Bite sized snacks! 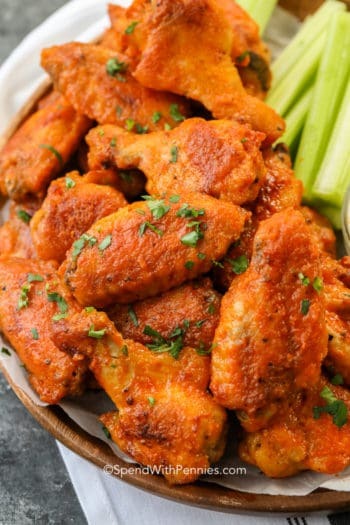 Baked Buffalo Wings – Crispy perfection, baked not fried! Note: You can purchase store bought buffalo sauce or mix 1/3 cup melted butter with 2/3 cup hot sauce (such as Frank's Red Hot). Whisk until combined. I hope you find many that you want to try Janis! 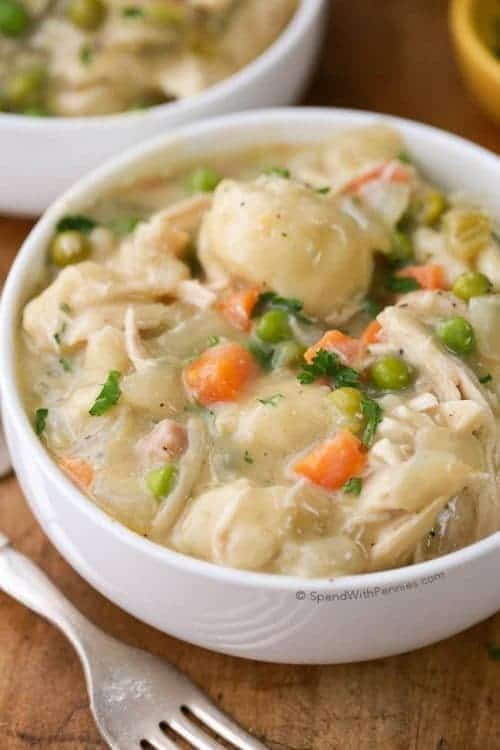 I make this dish all the time using your recipe and my husband and I love it!!! Always a go to. Today I decided to switch things up and toss the cauliflower in yellow curry sauce instead of buffalo. It came out great!! Yummy idea Becca! So glad you both love it (this is my Mom’s all time fave recipe on the site)! I’ve made this dish so many times using this recipe and I love it!!! Today I decided to switch things up and toss the cauliflower in yellow curry sauce instead of buffalo, turned out great!!! I have tried SEVERAL buffalo cauliflower recipes and this one is BY FAR the best one…hands down. And that bite pic? It looks exactly like that. the process is pretty time consuming though. I just blame that on the ocd as I want every bite to be coated completely and was doing each floret indivually. lol I’m making it again tomorrow with some potato wedges and maybe some pan roasted asparagus. THANK YOU SO MUCH FOR THIS RECIPE!!! DELICIOUS!! YAY Moe!! This is my Mom’s fave recipe on my site too so I’m thrilled to hear you love it as much as she does!! :) Thank you! I’m excited about making these. To keep the carbs low, what can I use to replace the Panko bread crumbs? I can’t say for sure as I’ve only made this as written. I am sure you can use the Italian bread crumbs. Is it possible to leave the oil out of the recipe? What type of difference would it make? Oil just helps it crisp. If you leave it out, let us know how it goes! 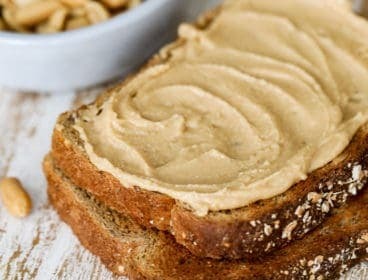 These looks so wonderful for snacking on while also staying on the healthier side! Perfect after my weekend of overindulgence (oops!). Definitely a healthier alternative Amy. Enjoy! I was JUST telling my husband we should try a breaded cauliflower recipe! I bet he would absolutely love this. Can’t wait to give it a try! Let me know how you like it Claire! What a great little snack. 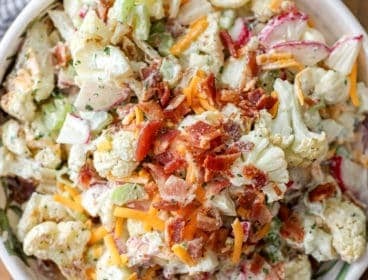 I’m trying to incorporate more veggies into my diet and this is such a perfect recipe to sneak in! 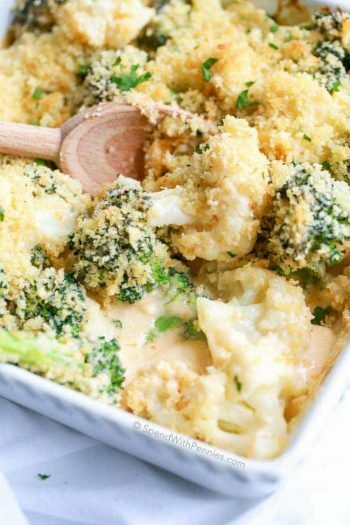 This is such a tasty way to add more veggies to any day! I hope you love it if you try it Jennifer! 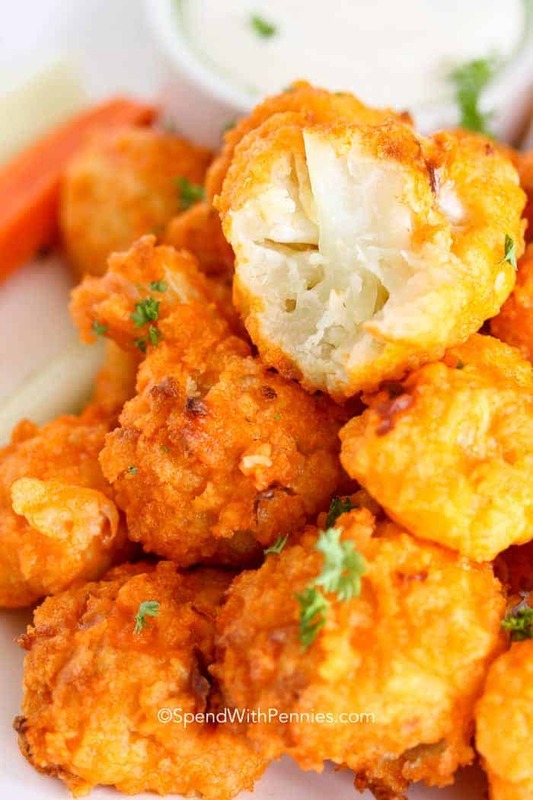 I love buffalo cauliflower, but have never breaded it. I will give this a try! Let me know how you like it Anne! Sounds both tasty and fun. 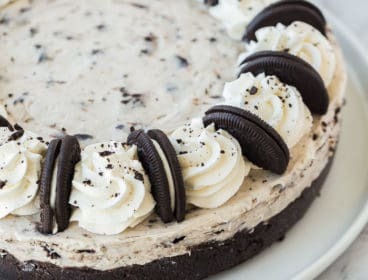 I have to try the baked version! It is almost so good it is addictive! I hope you enjoy it! The contrast between the coating and the white of the cauliflower is just so pretty! This looks like perfect party food! I have to agree it is pretty! It is also pretty tasty! Have a great day Ashley! This reminds me of my mom. She’s make something very similar but coated it will rice flour not breadcrumbs. I bet the breadcrumbs taste better and have a nicer texture. I need to try this soon. What a great way to use up some cauliflower and give that awesome buffalo flavor. 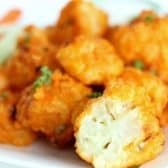 I have been known to make buffalo cauliflower stuff before and I might need to give this recipe a try. I hope you love it if you try it Ben! OH my… just look at these delicious bites! Easy tasty and just perfect. I bet my kiddo will love these. I hope the kids love it Natalie! Buffalo anything is my crutch! This is such a great, healthy option. I already like buffalo so this switch should be a no brainer! It is such a delicious alternative! Enjoy, Lauren! They have this at my local theater and it’s my new go-to movie snack. I need to perfect making it at home! So yummy! I wish my movie theatre had it! Thank you Emily! You WILL love it! What a wonderful sounding snack, I love cauliflower, one of my favourite vegetables. It’s so versatile and the flavour is incredible. I love the flavor of this one too Brian! Glad you enjoyed it! 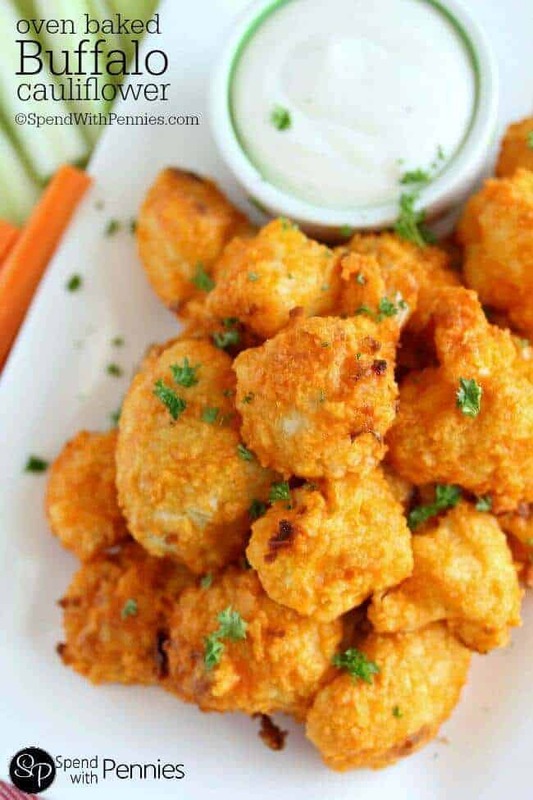 Love this oven baked buffalo cauliflower great game day appetizer I need to try it as I get bored with cauliflower curry dishes. Love this healthier version of chicken wings. Perfect! Love this vegetarian version of buffalo wings! 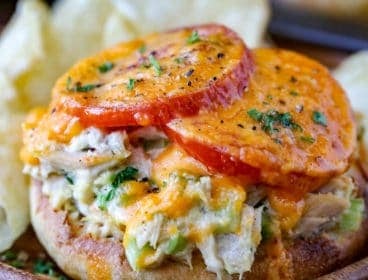 These look so amazingly delicious, I can’t wait to make them soon! Thanks Emily, definitely my Mom’s fave recipe on my site!! Made these today and took them to work. I didn’t get a chance to try them.My co-workers couldn’t stop eating them. Now I have to make more for just me. Thanks for the recipe. Yay! So glad everyone loved them… this is my Mom’s FAVE recipe! So disappointed. The bottoms of these burnt before they had even been in the oven for the first 15 minutes. I can’t say for sure why yours burnt, we’ve made these countless times and never had a problem with them. Did you put them in the middle rack of the oven? I was skeptical about these because I’ve never had success oven-frying any battered food. However, these came out perfectly crisp on the outside and tender on the inside. I’m sure they’ll been a frequent request from my heretofore vegetable-loathing son! He loved them! This recipe is a winner. I am so glad your family is enjoying this recipe! I made them and it came out great.The only negative thing about recipe is the bake time.The “wings” were burned at bottom and I spent time cutting the burned pieces.My boyfriend didn’t mind the burnt pieces and he enjoyed it too.Next time I’m baking them at 10 mins. I hope cutting the time helps. I guess it is true that every oven cooks a little different from the next. I haven’t tried it but frozen cauliflower is already quite soft so I’d worry it would become mushy. If you do happen to try it, please let us know how it goes! I am traveling today and plan to bring these to a friends house. 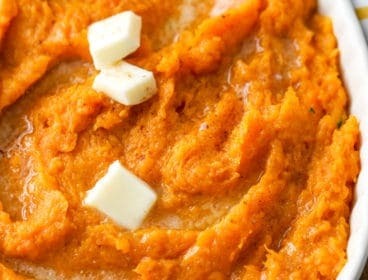 Could I mix the batter ahead of time and place it in a bag with the cauliflower and then drain it when I get to my friend’s house? Welcome to any tips cuz I love these at restaurants and want to be able to make them at home. No matter what I do, I can not get them to not stick to the pan or foil or parchment…I’ve tried everything. Is there a hint? Because we love these, they just make a huge mess and I lose half of them to the pan! I’m not too sure why they would stick. Make sure that they are coated and the panko is sticking well (so they are not too wet). You may want to try putting a bit of vegetable spray or olive oil on the foil paper or pan if sticking seems to be an issue. Amazing! 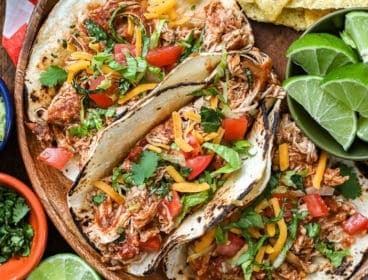 I am a vegetarian and my non-vegetarian husband loved these! We will make again! Thank you! :) So glad you enjoyed! I made this tonight for our Game Of Thrones party and it was the hit!!! I substituted the milk with sou milk and used gluten free bread crumbs and flour, it turned out fantastic!!! I will be using this recipes for years to come!! I’m so glad you loved it Kimberly! Delicious!! We devoured it – I added crumbled bleu cheese and sliced celery, served on a bed of spinach. Thank you! I had trouble after the first baking process when it was time to toss in the buffalo sauce. Most of the panko was falling off during the process so I decided to hand dip them though a lot of panko still fell off :/ any tips here? They still turned out amazing! I’m glad you still enjoyed them! Some of the Panko will definitely fall off but most of it should stay on. You can gently press the Panko once you sprinkle it on to make sure it sticks to the batter. Hope that helps. Has anyone tried freezing these before? I just bought from Trader Joes Kung Pao Cauliflower from the freezer section (I haven’t even tried it yet), but it got me thinking I could make a big batch of this to put in the freezer too! Thanks for the recipe! I couldn’t get mine “crunchy”. Perhaps next time put on parchment paper? Any suggestions? Still ate it up however, just texture felt more steamed. 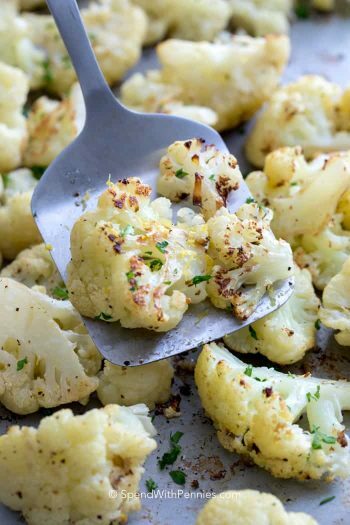 You’ll want to make sure your cauliflower is VERY well drained to avoid steaming. Mine wasn’t crunchy but it was crispy (if that makes sense). Once you add the sauce it does soften the batter a little bit. I just went to make this and realized I didn’t have bread crumbs. I am off to the store first thing tomorrow. I can’t wait to have this for dinner! Enjoy! I could eat these for ANY meal of the day (breakfast included). So good!! So easy to make to!! This is a new family favorite, and probably a new party staple! THANK YOU!!! These were SO yummy! We will definitely be making them again! Thanks for the recipe! So glad you enjoyed them Melissa! We’ve made buffalo cauliflower in the past and it’s been good, but wow. We’ve made this twice so far and now it’ll definitely be a regular menu item!! This past time, we made half the batch with barbecue sauce for our 1-year-old son and he devoured his portion. I’m planning to share this on my blog because this is an amazing recipe. Thank you! I’m so glad you loved this as much as we did! What a great idea putting BBQ sauce on it for kids! I think I will try this with BBC sauce so that my son can have some too. If he doesn’t like the spice, they’re great with just seasoning salt as well and dipped in a creamy dip like aioli or ranch. Love it! This has made it to my Super Bowl party menu. Definitely perfect game day food! Enjoy! Where’s the buffalo sauce recipe? You can purchase store bought buffalo sauce or mix 1/3 cup melted butter with 2/3 cup hot sauce (such as Frank’s Red Hot). Whisk until combined. Made this today and it was amazing! My sauce was 1 cup Frank’s, 1/3 oil, 1 tsp garlic, 1 tsp onion. I’m so glad you loved it Mary! One of my favorites for sure~! Made these today and they are sooooo good! I’m not sure what happened during the first oven step, they started to burn on the bottoms and were already tender, so I didn’t need to cook them for the add’l 10 minutes. So maybe next time I will only bake them for 10 minutes instead of 15. Nevertheless, they turned out yummy and I will definitely be making these again. So glad you enjoyed them Janet! These look amazing. I’m going to be making for dinner tonight.